When it comes to processing power, the human brain just can't be beat. Researchers in the emerging field of "neuromorphic computing" have attempted to design computer chips that work like the human brain. Instead of carrying out computations based on binary, on/off signaling, like digital chips do today, the elements of a "brain on a chip" would work in an analog fashion, exchanging a gradient of signals, or "weights," much like neurons that activate in various ways depending on the type and number of ions that flow across a synapse. The research was led by Jeehwan Kim, the Class of 1947 Career Development Assistant Professor in the departments of Mechanical Engineering and Materials Science and Engineering, and a principal investigator in MIT's Research Laboratory of Electronics and Microsystems Technology Laboratories. 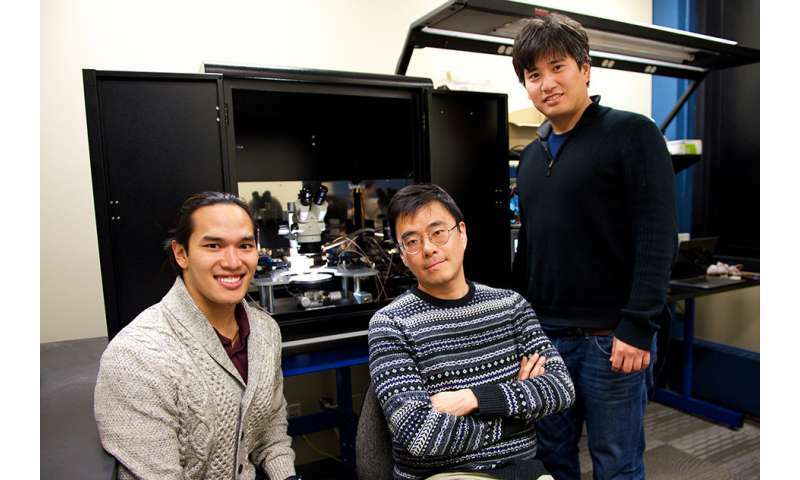 His co-authors are Shinhyun Choi (first author), Scott Tan (co-first author), Zefan Li, Yunjo Kim, Chanyeol Choi, and Hanwool Yeon of MIT, along with Pai-Yu Chen and Shimeng Yu of Arizona State University. Most neuromorphic chip designs attempt to emulate the synaptic connection between neurons using two conductive layers separated by a "switching medium," or synapse-like space. When a voltage is applied, ions should move in the switching medium to create conductive filaments, similarly to how the "weight" of a synapse changes. But it's been difficult to control the flow of ions in existing designs. Kim says that's because most switching mediums, made of amorphous materials, have unlimited possible paths through which ions can travel—a bit like Pachinko, a mechanical arcade game that funnels small steel balls down through a series of pins and levers, which act to either divert or direct the balls out of the machine. Like Pachinko, existing switching mediums contain multiple paths that make it difficult to predict where ions will make it through. Kim says that can create unwanted nonuniformity in a synapse's performance. "Once you apply some voltage to represent some data with your artificial neuron, you have to erase and be able to write it again in the exact same way," Kim says. "But in an amorphous solid, when you write again, the ions go in different directions because there are lots of defects. This stream is changing, and it's hard to control. That's the biggest problem—nonuniformity of the artificial synapse." To do so, the researchers started with a wafer of silicon, resembling, at microscopic resolution, a chicken-wire pattern. They then grew a similar pattern of silicon germanium—a material also used commonly in transistors—on top of the silicon wafer. Silicon germanium's lattice is slightly larger than that of silicon, and Kim found that together, the two perfectly mismatched materials can form a funnel-like dislocation, creating a single path through which ions can flow. The researchers fabricated a neuromorphic chip consisting of artificial synapses made from silicon germanium, each synapse measuring about 25 nanometers across. They applied voltage to each synapse and found that all synapses exhibited more or less the same current, or flow of ions, with about a 4 percent variation between synapses—a much more uniform performance compared with synapses made from amorphous material. "This is the most uniform device we could achieve, which is the key to demonstrating artificial neural networks," Kim says. As a final test, Kim's team explored how its device would perform if it were to carry out actual learning tasks—specifically, recognizing samples of handwriting, which researchers consider to be a first practical test for neuromorphic chips. Such chips would consist of "input/hidden/output neurons," each connected to other "neurons" via filament-based artificial synapses. Scientists believe such stacks of neural nets can be made to "learn." For instance, when fed an input that is a handwritten '1,' with an output that labels it as '1,' certain output neurons will be activated by input neurons and weights from an artificial synapse. When more examples of handwritten '1s' are fed into the same chip, the same output neurons may be activated when they sense similar features between different samples of the same letter, thus "learning" in a fashion similar to what the brain does. The team is in the process of fabricating a working neuromorphic chip that can carry out handwriting-recognition tasks, not in simulation but in reality. Looking beyond handwriting, Kim says the team's artificial synapse design will enable much smaller, portable neural network devices that can perform complex computations that currently are only possible with large supercomputers. "Ultimately we want a chip as big as a fingernail to replace one big supercomputer," Kim says. "This opens a stepping stone to produce real artificial hardware." "When it comes to processing power, the human brain just can't be beat"
-At the moment. But why try to emulate an obsolete form factor? Do we really want computers with undependable memories, intermittent attention spans, and fragile concentration? Do we need computers that depend on emotion for motivation, that are prone to delusion, fantasy, and psychosis? Can we tolerate machines that regard input from their senses and reasoning skills as optional? These faults are due to fundamental structural defects, of an evolved system pushed far beyond its natural capacities. Scrap it and start from scratch. "Scrap it and start from scratch." The kinds of problems that are proven solvable using the proposed technology is astounding thats why. Hardware capable of vastly speeding up the implementation of deep learning networks would be an incredible boon. It's not about reproducing the brain at all. It's about reproducing (and commercializing) the analyzation process that the brain is capable of. Thanks Otto for answering for me. Nice to know there is an issue we can agree on. Still, I also agree with the point that Parsec made about continuing the research into processing of information. Oh go ahead... Call me Mr. Contradiction! I know your dying too. It's okay, I can see my own faults. They amuse me. My reasoning? Continuing this type of research is very important. That, understanding this burgeoning threat to Human Free Will? We can learn how to destroy it.